Photo of Lauren and her bike (Rosey Lakos). I never thought my older sister would be killed while riding her bike to work. She did everything right as a cyclist: wore her helmet, cycled with traffic, had a bike bell, and rode in bike lanes when provided. In spite of my sister’s own effort to ride safely, she had no chance against the vehicle that killed her. At 8:35am on April 15, 2016, a driver turned left from Classon Avenue to Lexington Avenue in Brooklyn, NY. My older sister, Lauren Davis, was killed by this driver while she cycled with traffic on Classon Avenue to her place of work. She had just turned 34 years old a month earlier. The other details concerning Lauren’s actual crash day are far too difficult for me to relive, but I will say one thing: I never thought the world could be such a cold and uncaring place in my family’s time of greatest need. When we looked for love and support, we found only insensitivity and disregard from strangers. In a daze of stupor and disorientation, my family and I took an overnight flight from San Diego to NYC. Our plane landed in the seemingly chaotic, but functional JFK Airport, where the next leg of our journey meant taking the A Train. In orange, plastic seats, we sat numb and paralyzed by what we were prospectively going to see during this day — the day after the crash. My family and I eventually found Lauren’s apartment in Crown Heights. And little did we know, her dwelling would serve as both a protective space and painful reminder of the wonderful person we had just lost. Saturday morning, we visited the collision scene where we sadly found some of Lauren’s items and her blood dappling the ground. Her broken sunglasses, a yellow Cramps band button, and pieces of her wicker basket lay discarded without regard. Seeing all these abandoned objects was like looking at the missing pieces to a lost puzzle box. What had happened to Lauren and why wasn’t she here? At a time like this, a time when I drifted in a dim and uncertain space, I would look to Lauren for guidance and support. But, she wasn’t there and she couldn’t help me navigate this unknown. And so, my family and I maneuvered through the messy logistical obligations of losing a loved one, while enduring the NYPD’s investigation. There was no time to grieve, no time to process the magnitude of our loss. New layers emerged when we visited the CIS (Collision Investigation Squad) headquarters in Flatbush. As five people, we entered a back office where we sat down to discuss the details of what the CIS knew thus far. The police officer handling our case, PO Christopher Paul, initially told us there was “no criminality afoot.” He divulged that the “accident” occurred at around 8:30am when there’s “a lot of traffic.” He then informed us that Lauren was riding southbound (against traffic), the car bumped her, and she fell off her bike. The PO suggested that he did not believe my sister made contact with the car. Then, he revealed to us that police officers on the scene had decided to move Lauren’s body to the back seat of their vehicle because no ambulance could arrive due to the heavy traffic. When asked if this was an appropriate response (as police officers are not trained EMTs), the officer told us that being transferred by a police vehicle is an honor they usually only reserve for one of their own. In an attempt to prove how distinguished it was to ride in a police vehicle when injured, he recounted a personal anecdote of a NYPD officer being shot in the head and then honorably transferred in the back of a police vehicle (even though there was no hope that he would live). This inappropriate analogy provided my family no solace and no reprieve in the initial shock of my sister’s death. We asked whether the driver was impaired. According to the police, the driver had no phone calls, no texts, no apparent distractions while turning left onto Lexington Avenue. The police officer revealed that the driver went to the hospital hyperventilating and later passed out due to being very distressed. At the end of our meeting, the police officer gave us a couple of documents: vouchers for my sister’s belongings, the initial accident report, and a diagram depicting a reenactment of the collision. 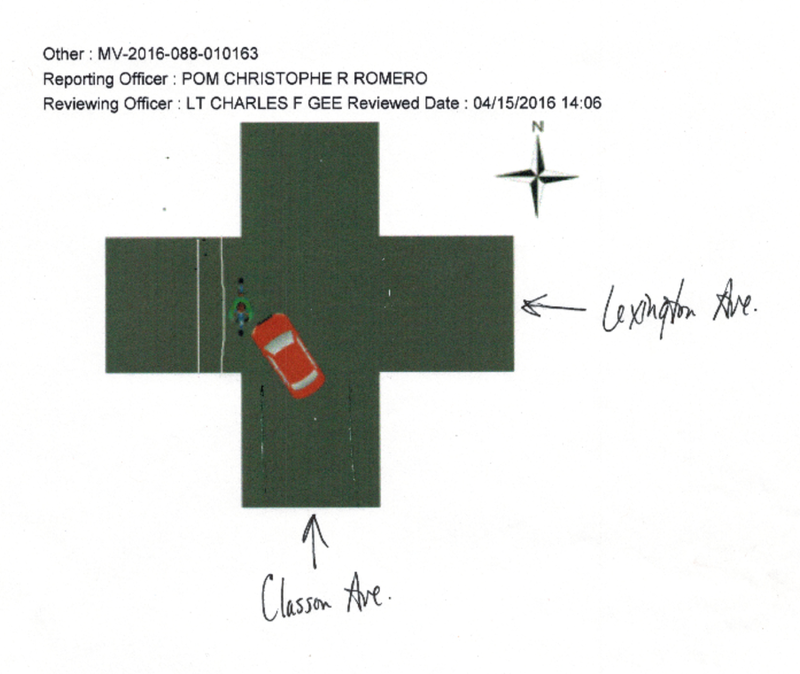 Initial diagram of crash provided in the initial “Accident Report” on April 16, 2016. Our meeting ended here and we continued on to our next hardship. That same day, my family and I were vexed with the task of identifying my sister’s body at the Medical Examiner’s Office. After waiting for what seemed like hours, ME staff escorted us into a side room shrouded in a blend of stale taupe, beige, and pale green. We sat waiting in front of a computer screen where moments later Lauren’s face would materialize for us to recognize. First, a plate with Lauren’s full name flashed on the screen. Then, “her face” — err rather, somebody’s face appeared. The photo we saw resembled nothing of what we knew Lauren to be. Bruising, skin discoloration, scrapes over her left eye — wounds all gracing a distended and unrecognizable human face. None of us could distinguish Lauren from the person’s visage on the screen. Her most identifiable feature — her smile — was not what we knew. Teeth had moved about her mouth in a nonsensical manner. There were spaces between teeth where no spaces had existed before. We stared blankly at the screen. This couldn’t be Lauren. Who was this? Where was Lauren? What happened to her? How could this much damage be inflicted one person? It was this moment when we requested photos of her tattoos, and ultimately, these unambiguous features confirmed what we hoped wasn’t true. Lauren was dead. She had been killed by the car that hit her yesterday morning. Lung trauma and rib fractures due to the car rolling over her. Blunt force trauma to the head resulting in several fractures, which the ME suggested could have been the result of her helmet hitting the hood of the driver’s car and/or being rolled over. Bruising on her neck which could have been caused by impact with a tire or pavement. And so, my sister’s pain and suffering became a list of fatal injuries on a piece of paper. Labeling my sister a “vehicle” implied that she, as a cyclist, was equally as powerful as the car that killed her. This label distorts the truth. Vehicles cause much more damage than cyclists, and it’s absurd to think that “vehicle #1” and “vehicle #2” are equals. An additional aspect that I feel distorts the reality of crashes, like my sister’s, is the misuse of the word “accident” in departmental language. The tragedy my family and I have faced and continue to face is magnified by the insulting connotation of this word. Collisions or crashes are preventable, not unfortunate accidents. Would a person label the violent act of shooting someone “an accident?” Then, why do we refer to crashes as such? NYC has worked to correct this shortcoming, but NYS, as a whole, has been apathetic in changing the official name used in these reports. 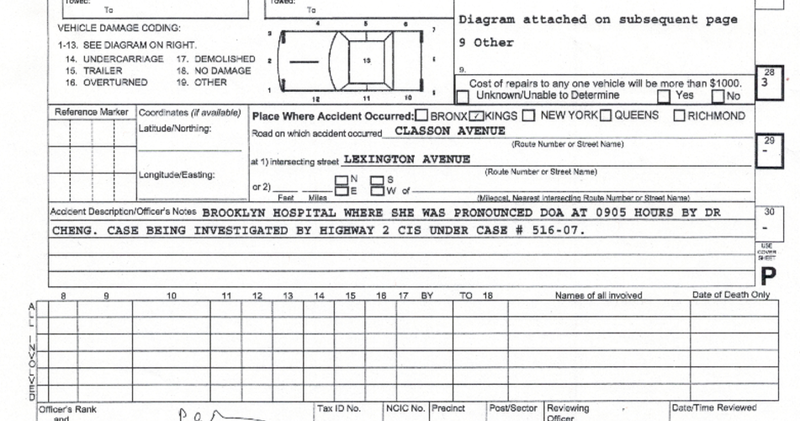 Documentation of traffic injuries, crashes, and deaths on Classon Avenue (TransAlt, Jan 2017). A table created by Transportation Alternatives, a nonprofit traffic safety organization, shows that 540 people have been injured in traffic related crashes on Classon Avenue between 2009 and 2016 — a staggering number that includes pedestrians, cyclists, and drivers alike. I never thought Lauren would be one of two people killed on Classon between 2009 and 2016, and one of ten cyclists injured on this street. 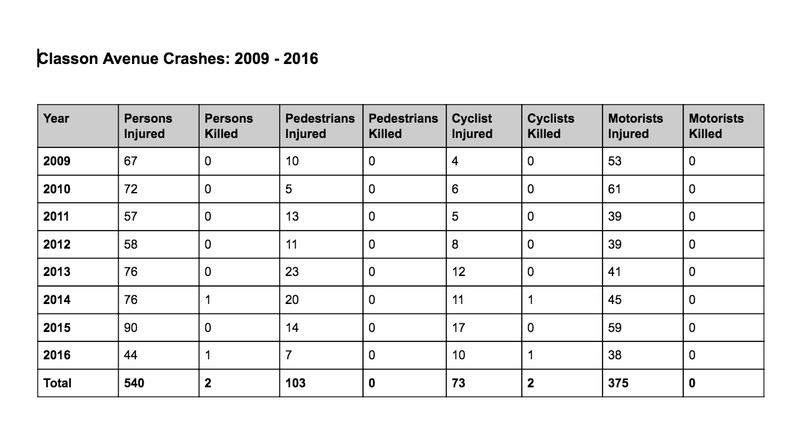 It’s difficult to envision that there may have been even more injuries on this street considering 40 to 60 percent of non-fatal bicycle-motor vehicle crashes often go unreported. Classon Avenue is a street that was a known problem at the time of Lauren’s crash. If the proper street safety precautions had been implemented, Lauren’s death could have been avoided. As of recently, I have begun to question the efficacy of the agencies that handled and are handling Lauren’s case. I’m baffled by how victims, like my sister, continually lose their identity as individuals. 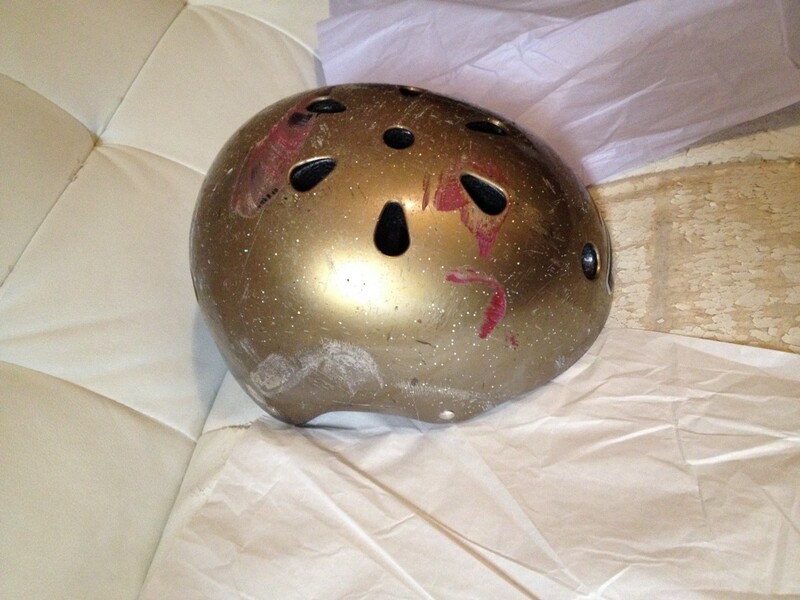 Here is Lauren’s helmet worn the day of her crash. 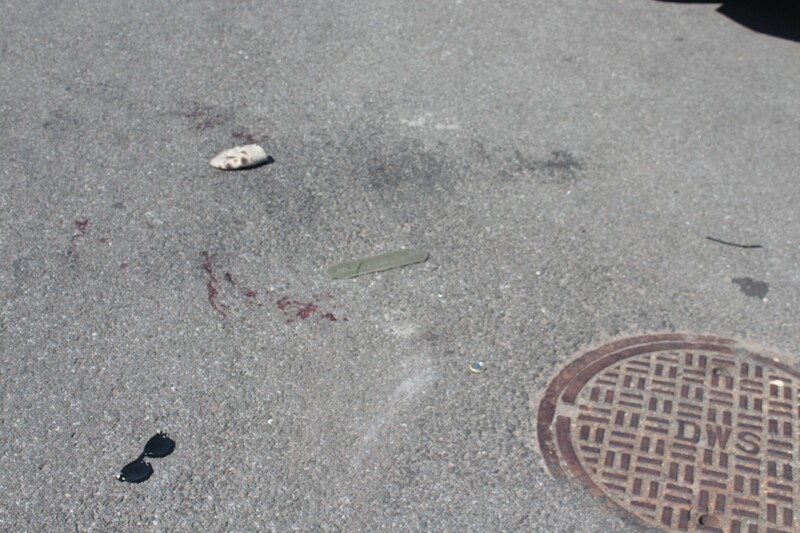 The red paint comes from considerable contact with the Fiat that hit and rolled over her. Victims of traffic transgressions and their crashes are often portrayed by anesthetized words like “bumped,” “fell,” and “accident.” Treating crashes with such reticence is a travesty and it disguises pressing issues, like: driver inattention and aggression, street design shortcomings, and missing safety infrastructure. From the beginning, Lauren was accused of wrongdoing. 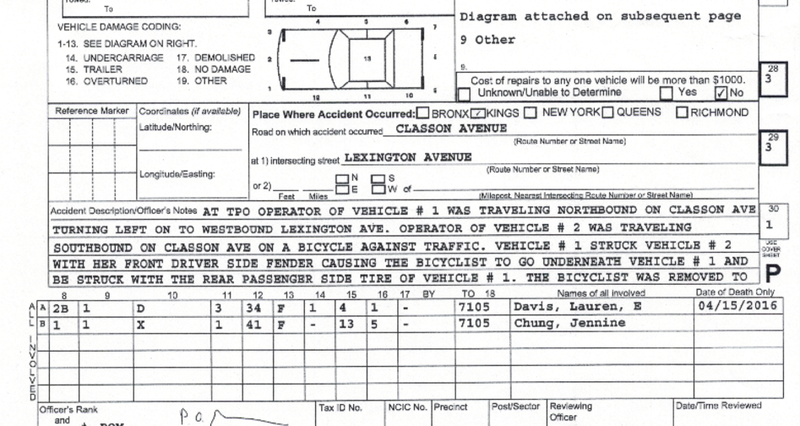 The police officer who filled out the initial “accident report” created a premature fiction surrounding my sister and her cycling habits. The media and initial witnesses fueled false claims that Lauren was going southbound on Classon Avenue, against traffic. As a supposed lawbreaker, Lauren became the wrongdoer and her death adopted a distinctive story — not that of being a victim, but a story of a criminal causing her own fate. I never thought the NYPD would brand my sister a wrongdoer without first gathering evidence, and I never thought the media would echo falsehoods without first waiting for all the facts. Leading the investigation with inaccuracy was CIS’ first and most detrimental misstep in Lauren’s case, and this was one of many times the false narrative surfaced as the truth. PO Paul suggested that the initial report was preliminary and could be easily amended, but we later found out revising police report errors is a much more elusive and difficult process. As my family and I sought justice for Lauren, we discovered that this deviated truth continually manifested itself not only within the investigation, but also, within the judicial proceedings. Written by Danielle Davis (@daniellekdavis8), the younger sister of Lauren Davis. 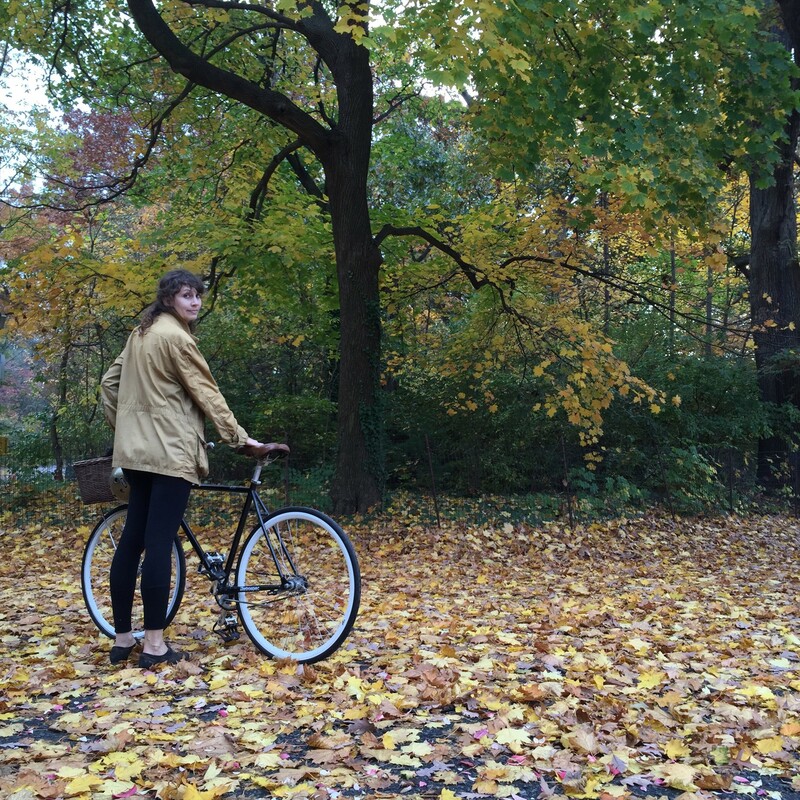 This is the first piece of a four part series about the life and death of a New York City cyclist, my sister, and the torture my family and I have gone through as we try to seek justice after her death. Sister of cyclist killed in Brooklyn and member of Families for Safe Streets NYC.